Summer is in the air and I can feel it the ocean is calling our name. Whether you live in the Philippines or planning to visit the country. Here are the 5 top beaches to visit.I am sure this top 5 beaches is easy to accomplish during summer if you want to. There are a lot of travel promotions you can avail if you plan it earlier. Remember there are 7,107 island in the Philippines, pretty darn sure you want to visit all of them. You never know, you are one of the luckiest to explore these island before you die. 5 Top Beaches you want to visit in Philippines. I am just realistic here, I listed 5 top beaches to visit this summer or all year round, hoping you can visit 3 of them this year or more and let me know how it goes. 1. Boracay, Aklan: It's one of the popular beach destination in the country and known from other country. Traveling to Boracay could be more affordable is you stay in your budget within. From budget to luxury Boracay is one of the 5 top beaches you want to visit in Philippines because of its white sand and blue calm water. You can fly either Caticlan or Kalibo, and take a ferry boat takes 10-20 minutes to Boracay. 2. 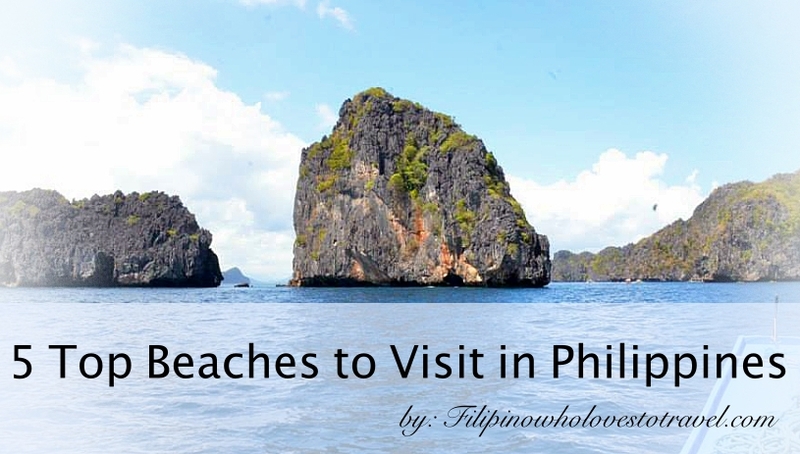 El Nido, Palawan: It's known with pristine water, coral reefs and white sand-beaches. Its one of the most popular to visit because of its indefinable views. From Manila you can fly direct to El Nido which is not popular thing to do. Most tourist fly from Manila to Puerto Princesa and take a shuttle to El Nido, Palawan and its more cheaper to do it if you are in a budget. 3. Samal Island, Davao: Davao City has a lot things to offer, and you can take a ferry boat to go in Samal Island. Samal Island is one of the popular place to visit once you are in Davao City. The beach is white sand and most likely popular in mangrove and coconut palms. There is a direct flight from Manila to Davao City and you can take a ferry boat to Samal Island.Most resorts offer its own ferry to take you in the resort which is included if you stay or plan for a day tour.You choose wisely. 4. Siargao Island, Surigao Del Norte: One of the most popular to visit is the Siargao Island if you are into surfing aside the white beaches, lagoons, caves. mangrove forest and seafoods. You would never get bored in this island and that's the reason its included as one of the 5 top beaches you want to consider to visit this year. Siargao Island is 800 kilometers southeast of Manila in the province of Surigao del Norte. It has a land area of approximately 437 square kilometres. From Manila you can fly direct to Siargao Island or you can fly to Surigao then take a ferry to Siargao Island. 5.Mactan Island, Cebu: Its one of the most historic place to visit. You can see more cultural activities, landmarks aside from beautiful beaches. I would say its more commercial and upscale compare to other beaches in the list. Considering Cebu is one of the big City in Philippines and has an International Airport within. To go to Mactan Island, you can either take a taxi or a ferry boat. Summer is one of the best time of the year to enjoy the beach.Hopefully, you can visit all the top 5 beaches this year. Uncommon substance material fabric to get exact information' and that i in truth need a have a review this sorts of blog situated up for having composing records. That is well just truly appropriately as a general rule pleasantly legitimately worth examining. The free easy robux hack is very amazing to get free robux for free for the free roblox free robux game then use my link for free.